There is nothing quite like it! I’m talking about the look of wonder in the eyes of a child. I am thinking of a particular child. Just a young boy. We don’t even know his name. All we know is that he was among the multitude that followed Jesus to a remote area on the east side of the Sea of Galilee. After a long day of ministry, the crowd began to grow hungry. Jesus shocked His disciples when He said, “Give them something to eat” (Matthew 14:16). The disciples were incredulous. How could they be expected to feed such a large group of people? Nothing about the boy’s lunch was impressive. Barley was the food of the poor. The loaves were probably small, and the two fish were about the size of sardines. Remember, it was the lunch of a young boy, not a grown man. But in Jesus’ eyes it was more than enough! Actually, Jesus didn’t need the fives loaves and two fish to feed the multitude. The one who rained down bread from heaven for forty years to feed the millions of Israel in the wilderness could have easily fed the five thousand using nothing more than His creative power. Even if He chose to use the boy’s lunch, He didn’t need all of it. He could have taken just one barley loaf and one small fish, or a small portion of each. Instead, He took it all. There are all kinds of biblical truths and spiritual lessons in this text just begging to be drawn out! We will address them at another time. The thing I find fascinating is that Jesus chose to partner with a young boy with a small lunch to do something really big. Together they fed a multitude numbering in the thousands! I can see Jesus as He took the bread and fish. The Bible says He prayed a blessing over them. I think Jesus then looked at the little boy with a gleam in His eye that said, “Watch this!” And as the boy watched in wonder, the miracle occurred. The five loaves and two fish began to multiply in the hands of Jesus, and the multitude was fed. There were even leftovers! The story leads me to ask if God really needs our resources to accomplish His work on earth. The answer is no. And yet He chooses to use them, so we can be part of something really big like reaching the world for Jesus Christ. For the rest of his life that young boy had a story to tell. To his dying day he told his friends and family about the day he partnered with Jesus to fed a hungry multitude. Let’s follow the boy’s example and do the same. The multitude is waiting. Young David arrived at the camp of the Israeli army ready to see a fight. What he saw instead was a fiasco. David saw a Philistine named Goliath standing on the battlefield hurling insults at the Hebrew soldiers and their God. Worse still, the blasphemous insults went unchallenged. Every ounce of Jewish pride rose up within the young shepherd boy destined to be king. As David gathered information in preparation to fight the giant himself, Eliab pulled him aside and dressed him down as only a big brother can do. Finally, David had heard enough. I’m sure he loved his brother. But David realized that Eliab was among the many for whom there isn’t anything worth living and dying for. David was made of different stuff. He looked his brother in the eye and asked this rhetorical question, “Is there not a cause?” (1 Samuel 17:29). Out of the entire army of Israel that day, David was the only person that believed in the cause. Like Eliab, there are many people moving through life without a cause. This is the “vanity of vanities, all is vanity” crowd (Ecc. 1:2). For them there is nothing worth believing in. Nothing worth living for. Nothing worth fighting for. Certainly nothing worth dying for. Trivial pursuit might be a fun game to play, but it’s a terrible way to live. The question of David echoes down through the centuries, “Is there not a cause?” Selah. Think about it. A little more than one-thousand years after he fought Goliath, David’s most prominent descendant stood before Pontius Pilate. Knowing He was just hours from the cross, Jesus told the Roman Governor, “For this cause I was born” (John 18:37). As David ran to the battle (1 Samuel 17:48), Jesus steadfastly and resolutely made His way to Jerusalem where He would be crucified (Luke 9:51). Nothing could stop Him! Jesus considered the battle worth fighting. And like His Old Testament predecessor, Jesus fought and won (Colossians 2:14-15). David fought and won for Israel. Jesus fought and won for the world! God put us on this planet to live for His glory. He created us to know Him and make Him known. So take hold of that for which Jesus has taken hold of you (Philippians 3:12), and remind yourself each day that you were born for this cause…for His cause. He could have been born into any home. He could have been the son of a doctor or a lawyer. A fisherman or a farmer. He could have been the son of a priest or a rabbi. When you think about it, any of these professions would have been appropriate considering who He was and what He was born to do. He could relate to all. But as God would have it, Jesus was born into the home of a carpenter by the name of Joseph. In his hometown of Nazareth Jesus was known as “the carpenter’s son” (Matthew 13:55). Joseph was in the building business. Before launching His public ministry, Jesus worked alongside his earthly father. They were more than handymen. It’s likely they built houses of wood and stone. Acting as civil engineers, they might have built bridges or other structures needed by people living in northern Galilee. 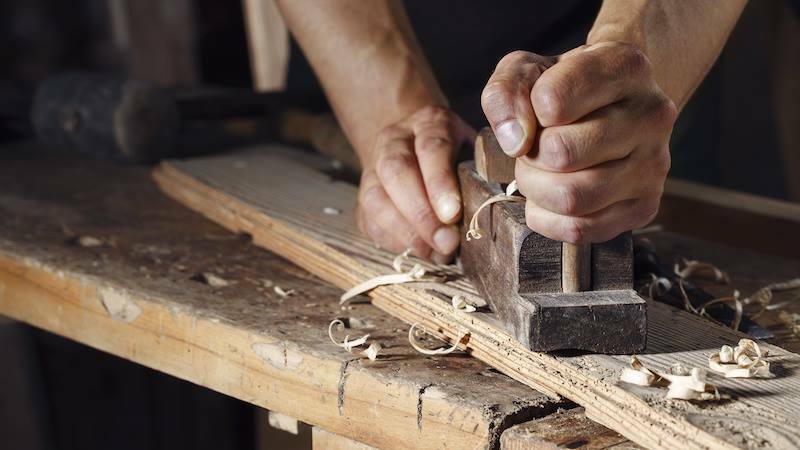 Whatever the case, Jesus earned the reputation of a quality builder and was simply referred to as “the carpenter” (Mark 6:3). Actually, the eternal Son of God was in the building business long before His incarnation as the son of Joseph. As a carpenter would frame a house, Jesus framed the universe and made the heavens and earth (Colossians 1:16 and Hebrews 11:3). Interestingly, Jesus made everything visible from invisible materials. In other words, He built it all using nothing except the divine energy of His creative power! From Abraham the Lord built the nation of Israel (Genesis 12:2). And within Israel, He established the royal family of David and would be its most prominent descendent (2 Samuel 7:12-16). Furthermore, the hand of the Master Carpenter is at work in the recent rebuilding of the nation of Israel. The psalmist spoke prophetically when he wrote, “The Lord builds up Jerusalem; He gathers the exiles of Israel” (Psalm 147:2). Concerning the Church Jesus said, “I will build my church, and the gates of Hades will not overcome it” (Matthew 16:18). In spite of everything that comes against it, the Church of Jesus Christ will prevail because it is built to last! In this world of trouble it’s good to know that the Master Architect is building a kingdom that cannot be shaken (Hebrews 12:28). While the kingdoms of earth will crumble and fade into oblivion like dust in the wind (Daniel 2:35), the kingdom of God will stand eternal. As believers in Jesus Christ we are citizens of the kingdom He is building, over which “He shall reign forever and ever” (Revelation 11:15). Just before he died, Joseph made an usual request of his family. He told them the day was coming when God would bring Israel out of Egypt to the land promised to Abraham, Isaac, and Jacob (Genesis 50:24). He then made them promise they would take his bones with them (Genesis 50:25). With that assurance, Joseph died and was buried in Egypt (Genesis 50:26). Fast forward some two-hundred years to the night of the exodus. The grip of Pharaoh was finally broken by the death angel, and the Children of Israel were in a hurry to leave. Remembering the promise, Moses gave the order, “Go get Joseph’s bones! We can’t leave without them!” So they dug up the coffin, and for the next forty years someone had the unique assignment of hauling Joseph’s bones all over the Sinai wilderness. In the meantime, Moses died making Joshua the new leader. Under Joshua the Children of Israel entered the Promised Land and launched the conquest of Canaan. Everywhere they went, Joseph’s bones went with them. Finally, in the next to the last verse in the book of Joshua we are told they buried Joseph’s bones in the family cemetery in Shechem. He made it! I think it’s interesting that in the roll call of the heroes of faith (Hebrews 11) the Hebrew writer said nothing about Joseph resisting Potiphar’s wife. Not a word is said about Joseph’s continued faithfulness in prison, or his interpretation of Pharaoh’s dreams, or his role in saving undoubtedly millions from starvation during the seven years of famine. Joseph lived his entire adult life in Egypt. He acquired fame and fortune in Egypt. He married and raised a family in Egypt. But Joseph never considered it his home. He knew he was a stranger living in a strange land (Hebrews 11:13). As nice as Egypt must have been, Joseph never felt like he belonged. Do you ever feel the same way? This world is not our home. We’re just passing through on our way to the place Jesus is preparing for us. So don’t get too attached to this old world because it’s just a temporary stop on the journey. Heaven is our forever home. And like Joseph, we are going to make it! As the hunter walked through the field in the early morning mist, he thought to himself, “It’s going to be a great day!” He was the rugged, outdoors type. Nature was his habitat. He was never more at home than when he was roaming the hills in search of game. Returning home later that evening, he was suddenly captured by the smell of food cooking on a campfire. Weak from hunger from the day’s exertions, he was drawn to the scent like a moth to a flame. Arriving at the source, he found his twin brother slowly stirring a pot of stew. How strange. It was almost as if his brother was expecting him for dinner. Famished, he cried out, “Brother, I am starving! Please give me something to eat.” With his eyes fixed on the pot he continued to slowly stir, Jacob said, “All you can eat in exchange for your birthright.” At that moment, his birthright was the last thing on Esau’s mind. The future mattered not. Only the immediate gratification of his flesh. So Esau agreed to the deal and sold his birthright for a bowl of stew. Finishing the dinner he wiped his mouth on his sleeve, stood and walked away, not realizing the enormity of what had just transpired. This incident in the life of Esau is a solemn reminder of how much can be thrown away in a moment of weakness, never again to be recovered. Whether it’s Esau selling his birthright to Jacob, Samson telling his secret to Delilah, David committing adultery with Bathsheba, or Peter denying Christ, the common denominator in each scenario is an unguarded moment of weakness. Weak moments are sure to come because we are human. Furthermore, the enemy is aware of our weaknesses and is sure to aim his arrows of temptation at those well known targets. Jacob didn’t ask Esau to sell his birthright after he had just eaten a full meal. He waited until he was weak with hunger. Esau’s weakness was Jacob’s opportunity, and it worked! Being aware of this strategy of the enemy can help us to always be on our guard. Avoiding situations or relationships that have the potential of rendering us spiritually weak is another good battle plan. Just as Superman avoided kryptonite, we can avoid the things that amplify our weakness and diminish our righteous resolutions. Lean on Jesus every moment of every day. Depend on His all-sufficient grace to see you through and you will be able to testify with Paul, “When I am weak, then I am strong” (2 Corinthians 12:10). How do you start your mornings? Do you start by turning on the television? Do you start the day by reading the news, or checking the latest scores on ESPN, or looking at your email, or catching up with friends on Facebook? How something begins is very important. A bad start can lead to a poor finish. If we give God the first fruits of our financial increase, He blesses the rest. If we give God the first day of the week for worship, He blesses the rest. And if we give God the first part of our day, He blesses the rest. Maybe we would be better prepared to face the day if we started it with God. Maybe things would just go better if we began each day talking to God. Just read through the 5th Psalm. It begins with prayer in the morning (vv1-3). It ends with protection, joy, blessing, and favor (vv11-12). Who wouldn’t want that? Consider again what David said in Psalm 5:3, “My voice You shall hear in the morning, O Lord; in the morning I will direct it to You.” That is prayer directed. Some people talk about prayer in a general sense. But it isn’t just the act of praying that counts, but the object to whom you pray. You can pray to the wind and nothing will happen. Prayer directed to the Lord yields results. Along with the Bible, be sure to start your mornings with prayer. Cast your burdens on the Lord every day. Make your needs known. Dare to ask for the impossible. Then like David, go through the day “in the strength of the Lord” (Psalm 71:16) looking up in faith for the answers God has promised. I love the many stories that are told and retold at this time of year. Stories that stir up the spirit of Christmas in our hearts. I especially like the stories that describe Christmas as seen through the eyes of a child. One such story is told about the night of the Children’s Christmas Play at a small church. They didn’t have an outstanding sound system, or great lighting. And their drama set left much to be desired. However, they had rehearsed diligently for the special presentation and were ready to tell the story of Christmas. The four and five-year-olds were first on the program. Little Joseph and Mary, dressed in their older brother’s and sister’s bathrobes, came down the aisle. On the platform a large door had been placed to represent the entrance of the Bethlehem Inn. Joseph politely replied, “You sure can. We need a room.” Right on cue, the Innkeeper responded, “Sorry, there’s no room in the inn,” and slammed the door shut. Even though the audience knew the story, the slamming of the door was a harsh shock. How can you slam the door on a man whose wife is in that condition? As instructed, Joseph knocked a second time. Again the door opened and Joseph said, “My ‘gespoused wife’ (you don’t always get the pronunciation right at five years of age) needs a room.” Again the Innkeeper said, “Sorry, no room in the inn,” and slammed the door shut. It’s a strange sensation. I’ve experienced it. Maybe you have, too. I will be preparing to leave the house for the day. After gathering all of my stuff before heading out the door, I will have the sudden feeling that something is missing. But what is it? I will go through a mental checklist that goes something like this: keys, billfold, checkbook, sunglasses, coffee, etc. That’s when it will hit me. I laid down my keys somewhere in the house, or I left my cup of coffee on the kitchen counter, or I forgot to pick up my sunglasses (a necessity of life in SW Florida). Has that ever happened to you? You know something is missing, but what? That’s the question that weighed on the mind of the Rich Young Ruler. In his spiritual quest for eternal life, he approached Jesus asking, “What must I do?” Jesus told him. Running down the checklist of requirements the young man thought, “I’ve done all of these.” That’s when it occurred to him something was missing. He asked Jesus, “What do I still lack?” (Matthew 19:20). There are other times when you know something is lacking in your walk with the Lord. Have you been there? You read the list of the Fruit of the Spirit (Gal. 5:22-23) and discover that an attribute like peace, endurance, or self-control is currently missing from your life. Maybe you are coming up short concerning one of the ten laws for living (Exodus 20:2-17). Or you might realize a certain spiritual discipline has gone dormant in your faith walk. Does it seem like your spiritual life is misfiring somewhere? Do you sense that something is missing? Then ask the Lord about it. “What do I still lack?” It’s an honest question that will receive an honest answer. Then you will know the truth, and the truth will make you free (John 8:32).